Sometimes the truth is a very thorny thing. Jane is found unconscious in a rosebush after being hit by car. She can't remember anything about the incident and the police think it's just the usual hit and run. That is, until Jane's memory comes back about the night before. It turns out there's a lot more than what everyone wants to believe. 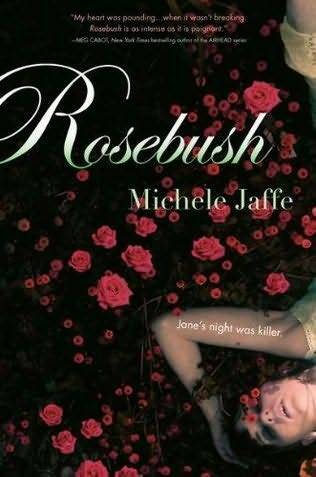 I found Rosebush to be one of the most enjoyable novels I've read in awhile. It met with most of my expectations and I wouldn't mind reading it again. The romance in the novel was much like any typical teen love story. The popular girl dating the popular boy, and they're perfect together. Well minus some hiccups. In comes a gorgeous male nurse and a hot friend who has the same interest as the protagonist. Add all these factors together and you get - chaos. It's not really believable but I didn't mind it too much considering there was a lot of character revelations from the interactions that occurred between the characters. I think none of the major characters really stuck with me. Even Jane wasn't enough to have me connect with her. Only Bonnie made a mark not because of who she was but because of the message she brought across. Most of the characters were just easy to despise. That's about it. However, that doesn't distract from the plot. I started out thinking it was a simple teenage novel with a mysterious twist to it. Instead, I got layers that held up a colossal structure. There's so much more to the supposed hit and run, so many things that add to one chilling truth. Many of the characters have great depths to them that it makes for an engaging read. It's also got quite a lot of messages for young readers, ranging from family and friend issues to trust and jealously. Basically the issues that a lot of adolescents have to face on an everyday basis. Also, the thriller aspect was every bit what it should be. There was suspense, mystery and twists. I never suspected a thing, just assumptions that changed from time to time. When the culprit was revealed I was like wow, okay. I see. It was surprising and sort of scary at the same time. I'm glad I followed my instincts and read this. Already, I have been drawn back into the story after skimming the ending again. It's not very memorable but that's good for me because that means I can read it again whilst developing new thoughts. Definitely give it a read.